On hand for the demo is producer Jonathan Dahan. After running through the DLC, I ask how he feels about the way Shadow of the Tomb Raider was received. "We're super happy with how [Shadow of the Tomb Raider] turned out, both on the critics side and performance," he says. "That's why we continued producing DLC, because we're excited about how it went." He talks about learning how to work with Crystal Dynamics, which he refers to as a "roller coaster." Dahan is a Tomb Raider veteran, having worked on Rise of the Tomb Raider, but Shadow of the Tomb Raider was the first time Eidos Montréal took the lead. In shifting from a support role to lead developer, Eidos had to work closely with Crystal Dynamics, which was challenging owing to the multitude of differences between the companies, not least the fact that they are on opposite sides of the continent (Crystal Dynamics is in San Francisco, Eidos Montréal is... well... you figure it out). Asked what part of Shadow of the Tomb Raider came out best, Dahan says, "One of my favorite parts of the game are the puzzles, both the challenges in the side tombs and in the main game. I really liked how we pushed them a bit further, we went into a more difficult iteration. That's why we did the more flexible difficulty, because we wanted to make this game a bit more difficult, including combat and traversal. We did that flexible system." In Caty's review of Shadow of the Tomb Raider, which she awarded a 3.5 out of 5, she wrote, "The tombs in Shadow of the Tomb Raider are the best in the series, easily. My only quibble is that I wish there were more of them, even though there's arguably more than its predecessors. Across the playable areas, there's usually just one to three tombs and maybe a crypt, the smaller areas leaning on the former number. The tombs are dense and take some time to complete, leading to the most clever puzzles in the entire game; contrarily, the puzzles you come across in the main story usually take no more than a couple minutes to finish. At least the season pass promises more tombs in the future." However, she went on to criticize the combat, which she felt was at odds with the game's themes. "There are two games within Shadow of the Tomb Raider. There's the great one. The one with no guns—only bows, other contraptions, and your wits to guide you. Where smearing Lara with mud and hiding against vines is the only tool the petite-sized woman needs to survive against a dozen men armed to the nines with rifles and shotguns. 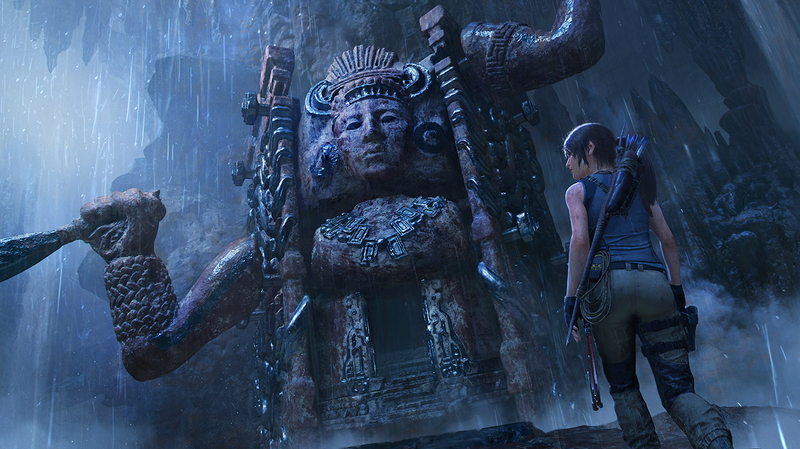 Where tombs and their puzzles are challenging and a wonder to explore. The one with the moments of Lara reflecting on her actions and it not feeling hypocritical somehow." The PS4 version of Shadow of the Tomb Raider ultimately earned a 75 on Metacritic, putting it roughly in the middle of the pack. By February 2019, it had sold some 4.14 million copies, which is a respectable number for an action game that otherwise didn't register at the end of the year (it wasn't on our Top 20 Games of 2018). Still, it was a decent first effort developer from Eidos Montréal. More than that, Zipacna's Craving, which is The Grand Cayman DLC's challenge tomb, is a genuinely fun speedrunning challenge. Dahan tells me that most of the development team struggled to get gold, only to see an online player earn a top time almost immediately. He's not wrong: the jump timing required to avoid watching Lara burn up in the lava pits is tricky. In terms of his main takeaways now that Shadow of the Tomb Raider is wrapping up, Dahan says, "We've had to learn to work with multiple studios, and we've come to have a very good relationship with Crystal Dynamics. Hopefully that's something we're going to continue doing because it brings a very nice feel to the games to have people with different experiences and backgrounds working on the game." Looking back on the generation as a whole, Dahan says that Tomb Raider's main accomplishment has been to relaunch as a technology leader. Dahan talks proudly about how Rise of the Tomb Raider was able to upgrade to Xbox One X and 4K relatively quickly, and says that Shadow of the Tomb Raider is "actually pushing the PS4 Pro and Xbox One X a lot." Ray tracing, a more advanced and lifelike way to render shadows and light in a scene, was released for Shadow of the Tomb Raider just recently. "We really wanted to make it a baseline that if someone buys an Xbox One X, they get 4K/30fps," Dahan says. "It's actually been impressive to see how well the console has held up. I can't wait to see what's next in terms of technological advances." With the seventh and final DLC set to be released on April 23, Eidos Montréal is just about finished with Shadow of the Tomb Raider. But even though the trilogy has wrapped and Lara Croft is definitely now a Tomb Raider (finally), Dahan doesn't think this is the end of her adventures. "I'd be extremely surprise if we didn't see more of it," Dahan says. "We're not able to say anything about what's happening next, but I'd be very surprised if we didn't hear more about the franchise." Stuck on Shadow of the Tomb Raider's challenge temples? Check out our complete guide to collectibles, locations, skill points and more in Shadow of the Tomb Raider. Tagged with Action Adventure,	Crystal Dynamics,	Eidos Montreal,	News,	PAX East 2019,	PlayStation 4,	Square Enix,	Xbox One.